3M™ Fibre Disc 785C is a durable fiber disc featuring high-performance 3M ceramic/aluminum oxide blend abrasive ideal for blending, grinding applications, and weld removal. Our proprietary ceramic/aluminum oxide blend stands up to challenging applications, outcutting and outlasting aluminum oxide. Our 3M™ Fibre Disc 785C incorporates a grinding aid to keep the workpiece cooler, protecting heat-sensitive alloys from heat damage and reducing re-work. These features along with a stiff fiber backing offer increased productivity for heavy-duty grinding on all metals, including stainless steel. 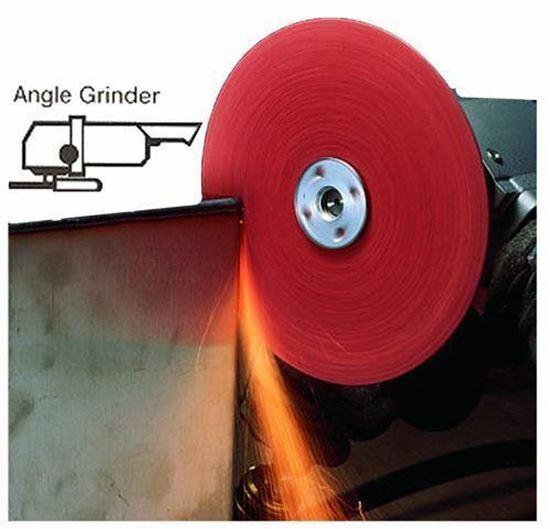 For optimal performance, the disc should be used with a face plate of the appropriate density for the application—a lighter density face plate for lighter weight grinding applications, and a harder density face plate for more heavyweight grinding applications. Using the correct face plate for the application ensures that the abrasive mineral will fracture as it should, maximizing the life of the abrasive. Face plates are sold separately. Our 3M™ Ceramic Abrasive Grain is designed to enhance hardness and toughness of the mineral. For increased performance, 785C products feature aluminum oxide blended with 3M ceramic abrasive grain, yielding excellent performance on any metal. Perfect for moderate to heavy stock removal, ceramic abrasives are engineered to cut fast and handle intense heat and stress applications. Ceramic/aluminum oxide blends surpass regular aluminum oxide abrasives in cut-rate and durability, making them an excellent choice for difficult grinding applications. Fiber discs are heavy-duty discs ideal for weld removal, grinding, and blending large and small areas of metal surfaces. They feature a tough, stiff backing that resist wear and can handle tough grinding applications.